The Kenya Medical Training College has two intakes per year. One in March and the other on the months of September every year through the KMTC online application portal. 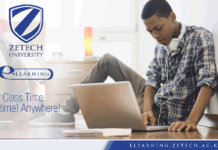 In this post, we’ll show you how to apply for KMTC Courses Online. All applications are done online on the KMTC Website. For a complete description of the courses offered and requirements, click on this link. 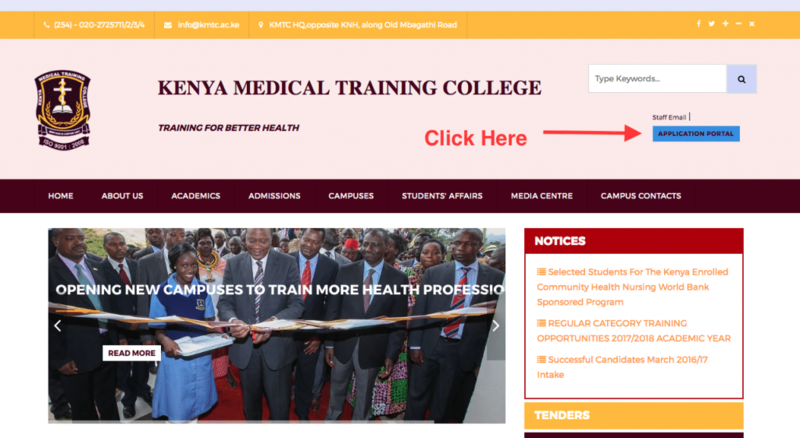 Visit the KMTC website, click on the tab named “Application Portal”. A new page opens up and this is where you need to sign up. Click on the applications on the left sidebar. From the drop-down menu, click apply. Select Option 1 (e.g. 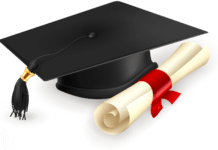 Diploma or Certificate or Higher Diploma/Upgrading) and then, Click on the “Search” tab. On the form that appears, select your desired course. Fill in the form details as guided by the form labels and ensure that all fields are filled. After that, submit your application. On the next page, select the desired course level (e.g. Diploma or Certificate or Higher Diploma/Upgrading) and then click on the “Search” button. Select your desired option 2 courses from the form that appears on the page. Fill in the form details as guided by the form labels. Check to confirm your detail and then, Click on “Submit an Application” button. You will be redirected to an “Upload KCSE Certificate” page. Select the KCSE certificate/result slip soft-copy file. You will be redirected to “Upload the Leaving Certificate” page. Select the leaving certificate soft-copy file. You will be redirected to “Upload National ID/Birth Certificate/ Passport” page. Select the National ID/Birth Certificate/Passport soft-copy file on the front side. Select the National ID/Birth Certificate/Passport soft-copy file on the back side. You will be redirected to “Confirm Courses” page. Check to see that the courses listed reflect your selected courses. Wait for up to ten minutes and refresh the page. Note that: The amount paid is for the whole Application Process. Click on the confirm button (Blue Button on the right side against the courses.) or Reject button if you need to change the courses. That is it, you have successfully completed your KMTc intake application online. We always recommend making sure to confirm all your courses. If you don’t receive two SMS confirming your courses please call KMTC HELPLINES – 0736993813, 0736212060, 0723000429, 0723004569, 0723004516. To see your recent applications online for the courses you’ve made on the portal, you can Click on My Applications from the left menu to see your applied courses. Best Reads: Five Books To Read This Year.